Within the first few miles of the Cayuga Trails 50 Miler, runners know exactly what they are in for. When race director Ian Golden blows his traditional Norwegian ram’s horn to signify the start of the race, runners follow the Gorge Trail for two miles and emerge from the woods at the first aid station, nestled above Lucifer Falls, located near an old rustic mill. 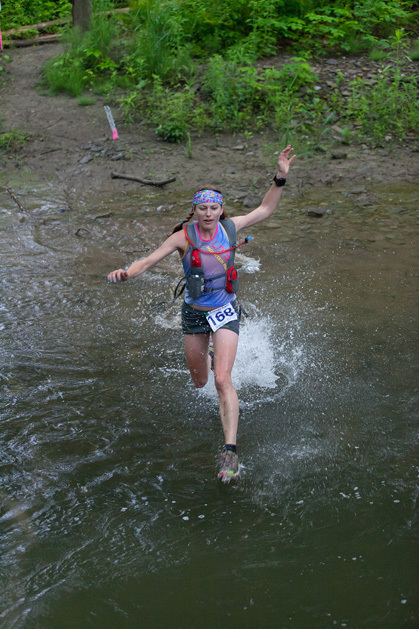 The on-course waterfall—one of many—is aptly named, as the Cayuga Trails 50 is a devil of a course. 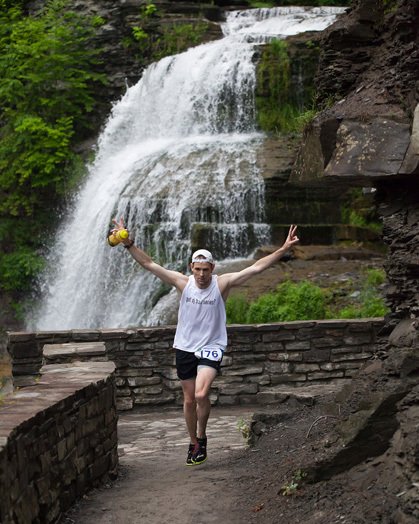 Tucked away in the beautiful trail town of Ithaca, New York, with almost 10,000 feet of elevation change, the Cayuga Trails 50 is serving as the United States Track and Field (USATF) 50-Mile National Championship race this year. 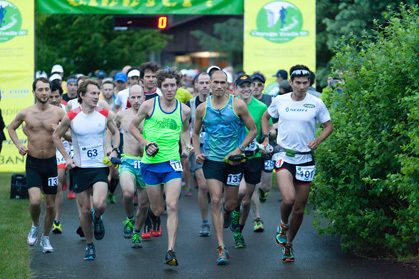 This means runners have the opportunity to compete with some of the giants of the sport of trail ultrarunning. 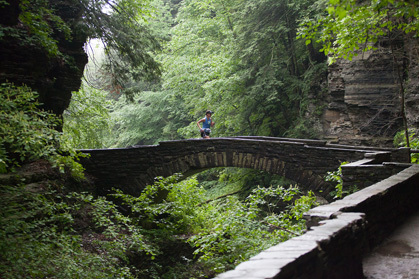 As the local saying here goes, “Ithaca Is Gorges”—runners will traverse many gorges of Ithaca while crossing Fishkill Creek, running through the mist at Buttermilk Falls, and then along deceptively named Comfort Road, which in reality offers no reprieve to weary runners as it rolls up and down. Ian Golden, an avid runner and owner of Finger Lakes Running Company, feels a strong affinity for the trails on which he placed the race. 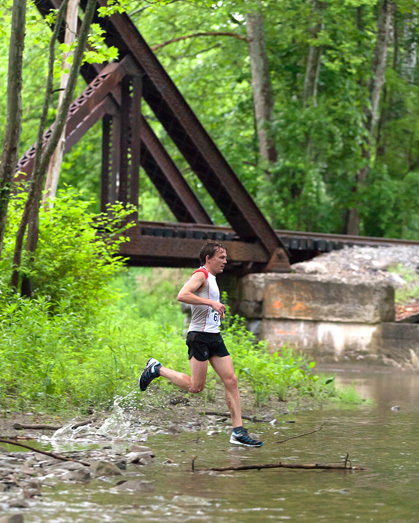 Golden says he finds the waterways calming, the climbs challenging, and never stops enjoying the picturesque views the park provides.The course has runners climb and descend the aforementioned gorges while tackling creek crossings and singletrack during each 25-mile loop. Pacers are not allowed. While the elites will be gunning for a National Championship, Golden has developed some in-race motivational prizes for everyone else. The first runner to miss a time cutoff has the opportunity to win the “Second Wind” award by getting to the next aid station under the next cutoff. If the runner carries on from there, he or she has a chance to secure the “Earned It Back” award, which refunds an entry fee if the runner makes it to the next aid station under the cutoff. Along the course, runners will also be trying to spot six wire hangers that will be planted in the ground with laminated photos of delicious-looking pie on them. The first six runners who pick up and drop off the hangers at their next aid station will win homemade pies from Mrs. Eddy, of the nearby, family-owned Eddydale Farm Stand. With all the fun going on in the actual race, Golden was sure not to leave out families and spectators. The race is planned around “Ithaca Fest,” a local food and music festival to keep everyone fed and entertained all weekend long. Eric Eagan, Co-Founder of #TrailsRoc, is an avid trail runner living in Greece, NY. When Eric is not running, he is hiking the Adirondack Mountains, the Finger Lakes Trail, snowshoeing the trails and hills of Western NY or canoeing the waterways of New York State.